DJ Khaled's Brand New Tour Bus & A Tour Of The Inside! Ahh, college memories. Particularly the summer of '98 ... my friends and I every Friday night could be found at Rocker's Island, Miami Beach when Khaled dj'd. 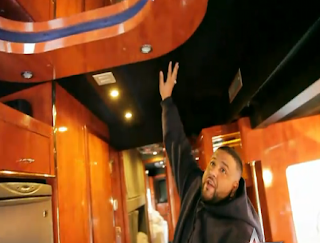 Now check Khaled out ... with amenities like a huge master bedroom, 2 bathrooms, marble shower, suede roofs and more on his tour bus!